Too Much Grace is a Straw Man. 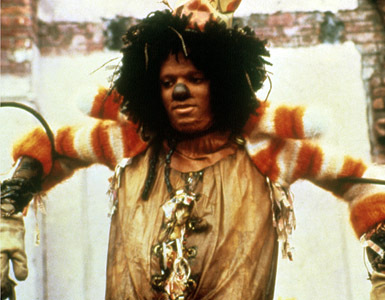 Do you remember what character Michael Jackson played in the 1978 movie, the Wiz? He played the scarecrow. Maybe I am a product of pop culture of the late 70’s early 80’s, but when I hear someone refer to a straw man, I think of Michael Jackson dancing around in that tattered outfit. But I don’t want to talk about movies today. What I do want to talk about is another kind of straw man. The term straw man is used to describe a fallacy of logic which mischaracterizes your opponent’s argument, making it easier to oppose. Specifically what I want to talk about is the straw man that is often set up to oppose a focus on grace in the life of the Christian. This straw man goes by many names, ‘Sloppy Agape’, ‘Greasy Grace’ or ‘Easy Believism.’ The argument goes something like this, “As Christians, we all know that it’s by grace that we have been saved (from our past sins). But Christians who continue to make grace the central theme of their relationship with God do so because they aren’t really interested walking in obedience to God or they’re just looking for an excuse for their sinful behavior.” I’m sure you see how that position would be easy to oppose; if it were true. If someone has no desire to obey God or to flee from sin, not only would they be bad a Christian, it would be questionable whether they were a Christian at all. Of course anyone with a desire to honestly follow Christ would be vehemently opposed to that approach. However, to say that Christians who have given the grace of God a place of prominence in their life and ministry is equivalent to hiding from the biblical call to holiness, is a mischaracterization of the highest order. It is simply not true. It is a lie. It is a straw man. Grace is not a free pass to sin. Grace is not making excuses for bad behavior. Grace is not calling sin by some other name. That is not grace. That is carnality. Grace is looking at the infinite holiness of God that is beyond my ability to comprehend; that is beyond even the stated commands in the Bible; that even my holiest efforts don’t measure up to. It is looking at that kind of holiness and being honest about the sinfulness that still exists in me, in spite of my best efforts, and knowing that it is only grace that offers love and acceptance from a God that holy. And that love and acceptance is given to me freely, not because of what I have done, but because of what Christ has done for me. That is grace. When I get to that place, grace remains the reason I celebrate, because I know that it’s grace alone that makes me a child of God. That doesn’t mean that I don’t strive after holiness with everything in me. That doesn’t mean that I don’t pursue obedience to God’s will and His commands like a hound chases a fox. But in the end, I haven’t even begun to approach His holy standards. In the end, I stand by grace alone (Rom. 5:2). That is why I would rather boast of my weaknesses (2 Cor. 12) and sing of His amazing grace (Eph. 2). Just because we make His grace the focus of our preaching, our worship, and our lives doesn’t mean that obedience and holiness aren’t important. That’s a straw man that’s easy to knock down. What it does mean is that we’d rather talk about and rejoice in what Jesus did perfectly for us, than our feeble attempts to follow in His steps. I’d rather talk about Him than me. I’d rather talk about grace. It’s amazing. Grace is amazing, and apart from God is too good to be true. Grace works wonders. A grace that doesn’t change us is not a grace at all. But grace is grace. It is not works, though it is the means of them. Rick, thanks for visiting and your comment. I totally agree. But what’s not OK, is to blame “grace” for Christian who should hate sin and don’t.